MISSION, KS--(Marketwired - Apr 22, 2015) - (Family Features) From elementary school to grad school, every graduation is a milestone typically celebrated with a big party. Sweet treats are a key part of celebrations, and by adding personalized details you can truly make your grad feel like one-of-a-kind. Make the cake your centerpiece. A sheet cake is easy to make and serve, holds up well and feeds a lot of guests. Round out the dessert table with other assorted treats like cupcakes, brownies and marshmallow crisp rice cereal squares. The variety adds visual interest and ensures you'll have something for everyone's tastes. Cupcakes are great for guests because they're perfectly sized for individual portions. If you're an inexperienced decorator or just pressed for time, try the classic 1M swirl. It's quick, easy and looks professional. Swirl up to three colors at one time using the Wilton® Color Swirl™ Tri-Color Coupler. The swirled multi-color icing technique may look intimidating, but with the proper tool it's a piece of cake. Or, try using round decorating tip 2A to create rings of icing. Find easy decorating instructions for these cupcakes at http://s.wilton.com/color-swirl-cupcakes. Now's your chance to get creative. 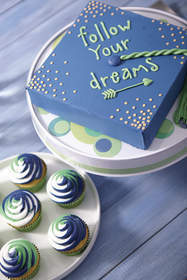 Make the party all about the grad by choosing their school colors or their favorite colors.